In 2011, SPC became aware of INVEST from the Federal Highway Administration Pennsylvania Division Office. SPC had recently completed their long-range transportation plan (LRTP), the 2040 Transportation and Development Plan for Southwestern Pennsylvania. After reviewing some of the INVEST resources and case studies, they decided to use the INVEST Version 1.0 System Planning module to evaluate the extent to which sustainability had been integrated into the LRTP. SPC divided up the scoring among their staff by assigning criteria to staff members who had expertise in the area focused on by each criterion. After the individuals completed the scoring for their assigned criteria, the whole team met to discuss their results and revise the scores as necessary. The LRTP scored 116 out of a possible 245 points, achieving a Silver rating. The INVEST evaluation reinforced much of what the MPO recognized as LRTP strengths and areas for improvement. Several of the areas where progress was needed were areas they were considering incorporating into the next LRTP. For example, SPC did not score highly on SP-06: Safety Planning or SP-08: Freight and Goods Movement. SPC was executing activities related to these topics, but the region did not yet have a safety plan or a freight plan in place. These plans had previously been under consideration for development, and the INVEST scores reinforced the need to move forward with them. Subsequently, developing safety and freight plans became implementation items for the next LRTP. 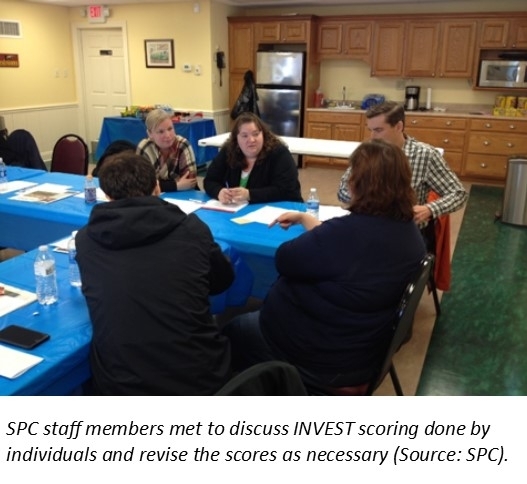 SPC used the System Planning module of INVEST Version 1.2 to score its next LRTP, Mapping the Future: The Southwestern PA Plan, which it adopted in 2015. Rather than starting from scratch, to score this plan the team considered which criteria had changed from the last LRTP, and adjusted the scores accordingly. Mapping the Future scored 164 out of 250 possible points and achieved a Platinum rating (see Table 1). Consistent incorporation of information from the system-level into project-level NEPA documents (SP-17). Although the INVEST scores improved overall from the 2040 LRTP to Mapping the Future, there were some criteria that did not improve as significantly as others. In some instances, SPC was not prioritizing the topics that the criteria covered or was not ready to take action on implementing them. For example, SPC scored zero points on SP-16: Infrastructure Resiliency for the 2040 LRTP and two points under this criterion for Mapping the Future. SPC has already begun to consider how they can best take action on the topic of resiliency, and is currently coordinating with the State and county governments on this area. Consequently, it was not a topic that they felt ready to include in Mapping the Future, although it will likely be addressed in their next LRTP. * For SP-17, 10 points were available in INVEST version 1.0, and 15 points were available in INVEST version 1.2. ** 245 total points available for 2040 LRTP evaluation (INVEST Version 1.0); 250 total points available for Mapping the Future evaluation (INVEST Version 1.2). SPC plans to use INVEST again to evaluate its next LRTP, which is currently in the early stages of development. This plan will take a new approach and focus on the dynamic forces that are changing the region – such as economics, freight, technology, demographics, and the environment – and how the region should address these changes. SPC is also participating in a Pennsylvania DOT (PennDOT) project that is using the INVEST Project Development module to track the sustainability of the Laurel Valley Transportation Improvement Project. SPC may decide to use the Project Development module in the future upon review of its use by PennDOT. Used INVEST System Planning/System Planning for Regions modules to evaluate two LRTPs, 2040 Transportation and Development Plan and Mapping the Future: The Southwestern PA Plan. Utilized staff members to score System Planning for Regions criterion based on their areas of expertise. Used INVEST scores to reinforce the need for action in certain topic areas, including safety and freight planning. Tracked improvements from one LRTP to the next.